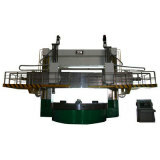 This series machine is suitable for finely and roughly turning cylinder and inner hole, inner and outer taper, surfacing, grooving, threading and curving of the ferrous, nonferrous metal and some kinds of non-metal materials with hard-alloyed and porcelain tools. The main drive is provided by DC motor (two-step speed-change) or AC motor (16-step speed-change) to engage in table speed-change. The table is thermal symmetric construction. The table spindle is centered by high-precision double-row short roller bearing whose radial clearance can be adjusted. With constant flow hydrostatic guideway and oil temperature device applied in axial direction, the table has features of higher swivel precision, larger loadability and smaller thermal deformation. AC servomotors (connected directly with ballscrew) which drive the ball-screw via rated gear-set to control the heads to feed or rapid move composes machine's feed system. The following guideway can be taken as horizontal guideway of vertical head: Linear dual-direction roller guideway, hydrostatic guideway, rolling & sliding guideway and slide guideway. CNC control system provides Siemens. The other CNC systems are also can be provided on customers' requirement. On customer's requirement, the followings can be supplied: Magazine, built-in tool setting device, boring & milling ability, table indexing and feed abilities, grounding ability, cooling device, left head and whole-loop control, etc.